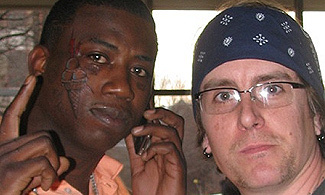 KayKiSpeaks.com: Say It Aint SO: Gucci Gets IceCream Cones Tatted on Face?! Say It Aint SO: Gucci Gets IceCream Cones Tatted on Face?! Last night, the ladies over at theybf tweeted that Gucci Mane went SO hard repping So Icey just days after being discharged from mental health facility/rehab. I couldnt believe my eyes! I mean.. I REALLY couldnt believe it! 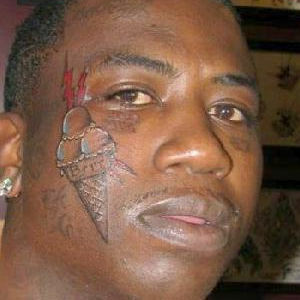 This man done gone and permanently put ice cream cones with the word brr tatted in them ON HIS FACE! Lord help!!!!!! Read more for a closer look at this foolery. Limited Edition Prada Shades -Dig em? This White Guy is SINGIN!! First Lady Obama On Oprah Today! New Brandy Album Summer 2011! Alexander McQueen Spring 2011 RTW!! Even Malaria Cant Fade Clooney's Handsome!!! Willow to Play "Annie" in Remake!! Justin Bieber Opens Up To Fans On Twitter.. Happy Birthday First Lady Obama!!!!! Lets Call This the Toya Carter Takeover! Will you make the switch for iPhone 4? New Music: Timbaland & Missy!!!! Beyonce Is Working On New Album! Who's The Lucky Lady Kissing Biebs?!?! News on Michael Douglas' Battle With Cancer! Mystery Photo: Who's The Bad Mama Jamma??! Angela Simmons Goes Blonde??? Feeling This?? Baby News! Guess Who's Expecting!?! Christmas Comes Late for Ocho Cinco Follower! Arizona Rep. Gabrielle Giffords Assassinated? When You KNOW You can Sing! Get Twilight Star, Kristen Stewart's Look! Ladies Suits & Ties Are IN! Sherri Shepherd & Vivica Fox Engaged! BabyKayKs welcome Terricha to KayKiSpeaks.com! What a Great Theme Song for 2011! Jazmine Sullivan Says Music Isnt Fun Anymore..